Nearly 10 years ago, the Bangurs were having a tough time running a two-mill cement plant in Rajasthan’s Beawar district. This was in 2002, after the market had gone through a four-year slump. Saddled with excess capacity, Shree Cement, their company, was hardly making any money. To compound its problems, it had borrowed money at 19 percent to fund expansion. Managing director Hari Mohan Bangur got nervous and decided to look for a prospective buyer. They zeroed in on French cement major Vicat, which was looking for a presence in India and had valued the business at Rs 800 crore. Moreover, it was willing to do a 50-50 deal. Vicat needed a toe-hold in India while the Bangurs needed funds to repay the banks. The price seemed right and two sets of lawyers had vetted the agreements. “Spirits were high that night,” says Bangur. The papers were to be signed at 9 am the next day. So Bangur went to his father Benu Gopal (BG), now 82 and chairman, and asked for one more chance to turn things around. The way he looked at it was that there were takers for the company. Even if he couldn’t turn things around, they could always find a buyer a couple of years down the line. Vicat even raised the price, but his mind was made up. “My life is over, it is for you to take this decision,” Bangur recalls his father telling him. BG Bangur seems to have done well by trusting his son. 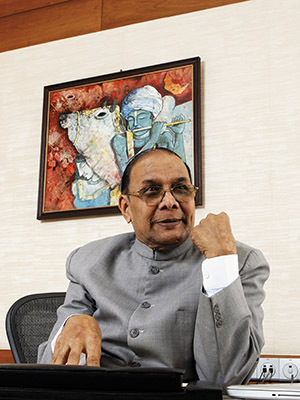 A decade later, Shree Cement remains firmly in his hands with a 10-fold capacity increase. Vicat, meanwhile, has had to partner with Andhra Pradesh-based Sagar Cements that barely manages to churn out 2.35 million tonnes annually compared to Shree’s 13.5 million tonnes. Shree Cement has seen its stock jump from Rs 45 ten years ago to Rs 4,500 today. Simply put: A rupee invested in Shree Cements in 1985 would have appreciated at a rate of 28.5 percent a year. This has propelled BG Bangur to 35th on the Forbes India Rich List with a net worth of $1.66 billion (he was 34th with $1.7 billion last year). What is it that makes Shree Cement a consistent performer? For starters, the market turned around sharply after 2003-04. More importantly, Bangur, who studied chemical engineering at IIT-Bombay, was able to make use of a pioneering technology in India. Add to that the complete operational freedom to his executives—he rarely travels to his plants—and you begin to understand why Bangur has succeeded where others faltered. 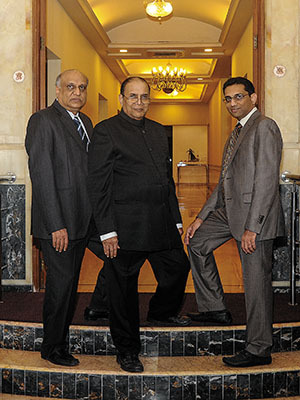 The Bangurs belong to an illustrious Marwari business family from Didwana in Rajasthan. In the 1950s and 1960s, they were among the top 10 business houses in India, with interests spanning jute mills, tea gardens, textiles and shipping. Construction began in the late 1970s. Prashant Bangur, Hari Mohan’s 33-year-old son and executive director, says delays were inevitable in those days. It took till 1985 to complete the plant and the company shipped out its first bag of cement in 1986. The cement market then was very different from what it is today. In an economy of shortages, it was possible to sell whatever was produced. Payments were collected before supplies were sent, a fortnight or a month later. Most manufacturers paid attention to quality but there were also instances of sub-standard cement, resulting in building collapses. In the 1990s, there was a paradigm shift when Gujarat Ambuja became the first cement company to start advertising. It was among the first to foresee that the industry would move from shortage to surplus. Bangur says, “Even though we are in a commodity industry, what we sell is confidence.” Following Gujarat Ambuja’s example, the cement industry realised that a substantial advertising push was imperative. Reason: The positioning determines the price you charge, even though quality—across three categories, A, B and C—hardly varies. Also, low price is equated with inferior quality. The Bangurs reached a settlement to divide their businesses in 1991. For Hari Mohan, this was the first step in taking Shree Cements to the next level. He managed to get some operational control. But the business was still shared between his father and uncle, who were conservative about taking risks. “Business is all about taking risks and after a certain point you need to back your gut,” he says. By 2002, a second settlement had taken place with his father over control of the company. One of the first things that Bangur did at that point was work on building a competitive advantage. This came in the form of petroleum coke. Reliance Industries (RIL) had just started their petroleum refinery in Jamnagar; a by-product of the refining process is bitumen, used as tar on roads. In 2002, RIL learnt that further refining produces petroleum coke, which was 40 percent cheaper than coal at that time. Bangur noticed that while no one was using this in India, it was being widely used in plants in Europe. He sent a team of six engineers and workmen to Germany and, within six months, they had a fair understanding of how to use petroleum coke in clinker plant furnaces. It took them about a year to get the furnaces operating with petroleum coke. By 2003-04, the market had also begun to turn around, and Bangur was able to pay off his bank loans. The company became cash positive and he needed a strategy to deploy the surplus funds. Beawar in Rajasthan, with its plentiful limestone supplies was a logical space to expand, and Bangur embarked on a steady expansion at the site. Today, the plant produces 13.5 million tonnes of cement from eight units. The company plans to take this to 25 million tonnes, with two units in Chhattisgarh slated to come onstream by 2015. Shree Cements has also set up 560 MW of power capacity integrated with the plants at Beawar and Ras in Rajasthan; part of the output is sold to the grid in Rajasthan. As a result of this massive expansion, sales have jumped from Rs 606 crore to Rs 5,792 crore over the past decade, giving a CAGR of 25 percent. In the same period, profits have soared from Rs 6.7 crore to Rs 1,003 crore, a jump of 65 percent. Given the size and output of the Beawar plant, Shree Cement knew it needed more brands to increase sales. As cement can’t be transported over long distances, the company had to make sure it sold the maximum quantity in north India. “I started thinking of how Hindustan Lever does it. Soap is made of the same material but the brands are different,” he says. This is unlike other cement companies that have one brand and other sub-brands. Bangur came up with a three-brand strategy: Shree Ultra, Bangur and Rockstrong. While Shree Ultra and Bangur are in category B, Rockstrong is in category C. All three cater to Delhi, Haryana, Rajasthan and western Uttar Pradesh. In order to make the distinction clear, the company keeps the marketing and advertising functions separate; offices of the different brands are in different parts of Delhi; they use different advertising agencies as well. Depots, too, are kept separate. For now, Shree Ultra and Bangur are doing well but Rockstrong is floundering: The company is planning the next steps in this regard. However, Bangur does admit that the lack of a national presence hurts him, as he is not able to embark on wide-scale advertising campaigns (his advertising spend is at 1 percent of sales). Despite the challenges, Bangur describes his entrepreneurial journey as “dream-like”. The contrast in the market’s reaction to him, from then to now, manifests in the positive evolution of his fortunes. He is someone who had to make multiple visits to Mumbai between 1998 and 2002 just to get a single analyst interested in his company. It was in 2003 that Vallabh Bhansali of Enam Financial Consultants decided to visit his plant and speak to the employees. His verdict: There seemed to be an alignment between the lowest employee and the chairman in their vision for the company. He believed the company could go places, and started recommending the stock to a select group of investors. Today, even with a Rs 16,000-crore market cap, Bangur is very clear that he has no plans to increase the share capital of the company, which stands at Rs 34 crore. He has also kept the dividend payout low at Rs 20 per share compared to an earnings per share of Rs 288. The rest of the money is invested in expansion. “In a commodity business, we lack pricing power and so, to increase turnover, volumes must grow for which investments are needed,” he says. More recently, First State Stewart, an Edinburgh-based investment manager, picked up a stake in the company (the figure has not been shared); the Bangurs still own 65 percent of it. “We like the company’s steady state of expansion and the fact that it is not bureaucratic,” says Angus Tulloch, head of Asia Pacific (ex-Japan) at First State Stewart. Also, he prefers an Indian cement company over a foreign-owned one as there are no concerns over royalty payments. Bangur, who works out of his stately Kolkata offices on Strand Road, overlooking the Hooghly river, says he plans to continue working for as long as his mind is agile. And how does he test that? Every year, he takes the Common Aptitude Test, which is conducted for admission into the IIMs. “In business, we all live on past glory. There is no way to tell if we are fit enough for the future,” he says. As long as his percentile is above 90, he plans to continue. Son Prashant also takes the exam every year. Except for a couple of years, father has always outscored son. Your outstanding and commendable performance with innovative vision had made your company's growth a great success story in international scenario to achieve 24 Million ton/annum capacity, I must congratulate you both for the great success. Kindly recollect our meeting at your Calcatta office in 2009 regarding innovative energy saving technologies in cement industry in raw meal silo area. Over the time, I have retired but as you know, an engineering mind keeps on working on innovations. My background just to remind you is, I am Chemical Engineer from IIT Delhi and had been a Scientist at NCB and retired in 2012, now running 64 years. Was incharge of Forum on Science and Technology and coordinator of paper evaluation of NCB's Three International Seminars, besides many diverse job functions in early career at NCB. Prior to this, conceptualised and contributed in setting up world's first cement plant based on Calcium Hydroxide Sludge, a bye product from carbide plant at Kota for Shriram Cement. Travelled to more than 20 countries . I have been working on ventless cooler technology after retirement and I have come up with a technology for saving upto 100 Kcal/ kg clinker in clinker cooler by way of changing the aerodynamics to atomise and increase the heat transfer area of clinker multifold, thereby increasing heat transfer rate resulting almost 50% reduction of cooling air intake in clinker cooler, eventually to achieve a ventless cooler. Besides this, a great benefit Carbon Trading and pollution control followes. This level of energy saving in financial terms is about Rs. 10 Crores per year for one million/ year capacity cement plant, amounting a saving of Rs. 240 Crores /year for your 24 Million per annum capacity. The modification can be implemented in planned shut down of any of the plants without wasting operational time . I am looking forward for implementing the technology in any of the coolers available during shut down and willing to have personal discussion on the subject beforehand either at Calcatta or at your Cement plant. The technology must be kept confidential and would only be discussed at your highest level, Therefore instead of email communications, we should communicate on phones to determine the further roadmap. Kindly let us make this technology a success story. Great to know so much in depth, wish Shree, will continue to climb success ladder, and shall break all the old records. Best wishes. Real attitude of a real mar wadi. inspirational. proud to be part of it. We are proud of u. It is extraordinary that Mr Bangur takes the CAT exam every year just as a mental virility check! Wish there were more leaders like him, specially in Indian politics! !